My Mother Has a Bed Sore That Requires Surgery. What Can We Do? Home » The Law & You » My Mother Has a Bed Sore That Requires Surgery. What Can We Do? A woman’s mother is in a nursing home and she was just told that her mother has horrible bed sores. They are into the done and are going to require surgery. The family is upset, is there anything that they can do? Find out on this Law & You with Ed and Molly. Ed: They said she was much better looking than Greg. Dave: Well, it’s hard to argue that. Alright, let’s get to our question tonight. This involves a situation from Nancy in Wilkes Barre. Nancy says, “My mother is in a nursing home and we were just informed that she had a terrible bed sore which is into the bone and is going to require surgery. I am furious. Is there anything we can do?” What could Nancy even do to get started with this? Ed: Nancy the first thing you’re going to have to do is to make sure you get the agreement for your mom being in the nursing home. I’m going to let Molly talk more about the specifics of how your going to pursue the lawsuit. This is the most important thing, and a lot of people don’t understand, that most nursing homes make you sign an arbitration agreement; What that means is that you give up the right to pursue legal action in the court system. A lot of people don’t even know that, so to all the viewers out there, whenever you or your loved one is going to be going into a nursing home, make sure you look at that agreement. You do not have to sign that if it has an arbitration agreement in it or you can strike that out of there; You don’t have to agree to that and I’m going to let Molly talk about it a little bit more and the specifics of what you’re going to have to do in the lawsuit. Molly Clark: Nancy following what Ed just said I hope you did not sign one of those agreements. If you didn’t then you should pursue a claim on behalf of your mom. What you should do to do that is to contact a lawyer, contact us if you’d like; We’d be happy to take care of that for you.You’ll have to gather some records for us or we could gather the records for you and see hoe negligent the nursing home may have been and then we could pursue a claim for you. Dave: I know this is something you handle at Fellerman and Ciarimboli so, how can our viewers reach you? Ed: We handle a lot of nursing home cases. You can reach us at 570-714-HURT; You can see us on the web at 714hurt.com. If you have a question, put it on our Facebook page. These are really time sensitive cases so, don’t delay on this. You really need to get to a lawyer quickly on something like this. 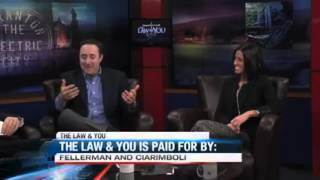 Dave: Results matter with attorneys Molly Clark and Ed Ciarimboli. Thanks so much for being here.